Believe it or not there were times when software choice was limited. These were the Dark Ages of computing when the Internet was excessive luxury, computers cost tons of cash and even worse – there were a limited number of programs you could use. In those ages you had to be really smart to create a unique product that would be seen and then remain on the market. 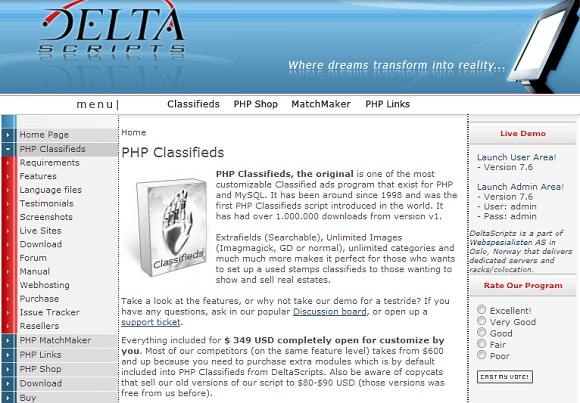 Very few products have achieved this and one of them is exactly PHP Classifieds by the Norwegian company DeltaScripts. PHP Classifieds has been around since 1998 and is the first PHP classified ad script to be distributed on the Internet and around the world. Since its introduction the script has had more than 1 million downloads and is still around – it definitely withstood the test of time! The secret to success of this script lies in its extreme flexibility – this classified ads program is one of the most customizable PHP scripts in the world. Once you obtain this software you have the right to change it in any way you see fit and as many times as you may need. Feel free to use it and abuse it by any means you can imagine! In addition you can add as many categories as you wish, add unlimited extra fields, an unrestricted number of images and much, much more! 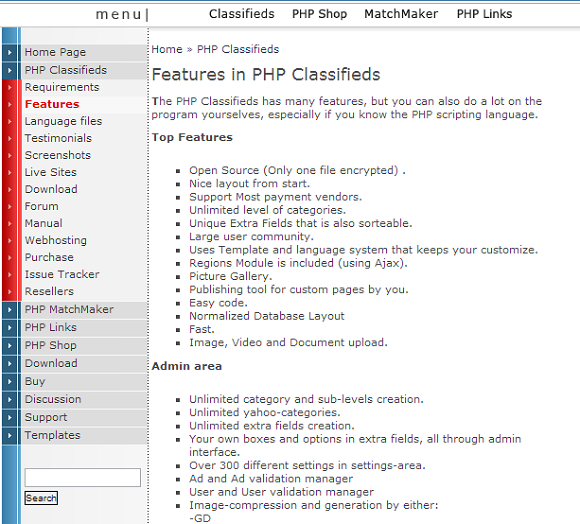 PHP Classifieds boasts an open source software license with only one file that is encrypted. You get a nice layout right from the start, a publishing tool, a picture gallery, support for most payment vendors, speed and code that is easy to understand. You think this is all? Think again – PHP Classifieds does have a ton of features that can easily take you a few minutes just to read, let alone understand! Did you know it also supports 22 languages? PHP Classifieds also excels in the support field in case you ever run into problems. The web site of this open source PHP classifieds system shows you a list of screenshots to see it in action for yourself and if this is not enough for you, you can take a look at a number of web sites that run this software. Or maybe you can read some testimonials of happy users. In any case, support is there and it is extensive – the home page of PHP Classifieds has links to the software manual and if something is not listed there you can use the users’ forum where you can ask questions on your issues and problems. The company has a live demo too that you can use and get introduced to PHP Classifieds before you actually purchase it. Yes, this software is paid. The home page of PHP Classifieds says it costs USD 349 although it seems that there’s a 50% discount at the moment and you can get it for USD 169. It is not little money, but for this much you get a fully customizable piece of software that includes a number of modules other companies charge extra for. Then given the longevity, flexibility and power of the software, along with its support, the price may not be considered that high. It depends on what’s valuable to you but it is always nice to know that you have software that you can adjust along with your needs without needing to buy a new program. Unfortunately it is not exactly clear how you can actually purchase this software, as the web site of the company requires you to register with it before you can get access to PHP Classifieds and even then you must provide a web site to attach the software to before you can actually complete the purchase. In most cases, however, you will most likely obtain your software directly from the Internet rather than dealing with CDs in the mail etc. It’s hard to find fault with PHP Classifieds. The software has everything to meet your needs and then some thanks to its extreme flexibility. A definite problem with it, however, is the lack of live online company support and the inability to directly contact the company. Instead you are prompted to send a message about your problem and then wait on a response from the company. True, there are other means for you to get your problems solved such as the online forum and the software manual but in the field of direct contact PHP Classifieds does lack. Is PHP Classifieds any good? Definitely! It offers unmatched flexibility, extensive indirect support, numerous features and more importantly quality that is around to stay 15 years after its first release. As with everything else this classified ads program does have shortcomings but after all you may not experience them at all – it all depends on where you come from and where you want to go. A great solution, which will meet all your needs thanks to its awesome flexibility. In addition the software does have excellent features that have allowed it to remain in use for 15 years. 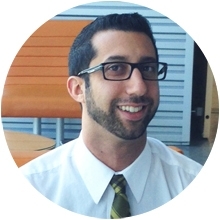 Alexander Yovchev - Alexander is a freelance writer who enjoys writing about gadgets, mobile phones and consumer technology. He also writes for Hitechreview. The Social Calendar to beat them all!